This chapter summarizes key projects and initiatives that are being implemented on very large scales (national/international) by national governments and commissions to build coastal spatial data infrastructures (SDIs). These include SDI efforts in the US and Europe that are closely related to ICAN, and as such are of great value to its mission of developing interoperable atlases, providing along the way solutions for the integration of not only technologies, but people, institutions, and institutional objectives. Coastal and marine spatial data infrastructure (SDI) is largely comprised of national-level datasets that are created with consistent technical standards, quality, and under adequate licensing terms, accessible for use in GIS and Web GIS, with accompanying metadata following appropriate standards, all complying with best practice (for a complete treatment of SDI in all parts of the world see Onsrud, 2007; Masser, 2007; and van Loenen et al., 2009). It follows that if an SDI is the overarching framework to assist people with acquiring, processing, using, and preserving spatial data, then a coastal web atlas (CWA) is an important subset of an SDI where all things “coastal” are concerned. CWAs often provide the datasets, mapping tools, and contextual information needed for an effective SDI, and in doing so reduce valuable time, money, and effort in the process. It follows also that CWAs would depend upon an SDI where standards are concerned (such as the use of Federal Geographic Data Committee or FGDC, contents standard for metadata in the US and the adoption of International Standardization Organization or ISO metadata standards in Europe). The issue of how CWAs will contribute to existing and future SDIs remains an exciting and still-open question (e.g., Wright & Dwyer, 2009; Wright et al., 2009). The case studies presented Chapters 6-14 of this book have provided many examples, all with the common theme of compiling various data sources and presenting them in a common, more understandable framework (e.g., a common clearinghouse), which in turn has fostered discussions, spatial analyses, and collaborative relationships across (and sometimes within) various jurisdictions. 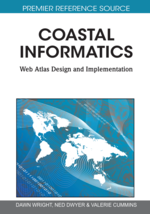 This chapter reports briefly on the developing concept of a federated atlas of the entire US coastal zone as in important component of an SDI. The US federal government is instituting the federated atlas in cooperation with partners at the state and local government levels, as well as academic institutions, non-governmental organizations and private industry. Many if not most of these partners would be purveyors of a CWA. Next is a description of an emerging European Atlas of the Seas as instituted by the European Commission, based on several years of planning and due for an initial launch by the beginning of 2010. The chapter ends with descriptions of related projects focused primarily on offshore oceanographic science but still greatly relevant to the coastal zone management emphasis of CWAs: the European Coastal-shelf Sea Operational Observing and Forecasting System (ECOOP), SeaDataNet, and the projects of SeaZone Solutions Limited, a wholly owned subsidiary of the UK Hydrographic Office. All of these efforts represent important opportunities for CWAs to leverage data, methods, and approaches and are of great value to ICAN in its mission to develop interoperable atlases that would contribute to an SDI and to effective coastal/ocean governance.